On February 1, 2015, 4,000 workers belonging to the United Steelworkers Union (USW), walked off their jobs at nine oil refinery and chemical plants across the U.S. By Feb. 10 another 1,400 workers went on strike at two refineries in Indiana and Ohio. The strike now effects 11 oil refinery and chemical plants used by BP, Shell, ExxonMobil, Marathon Petroleum, and Lyondell Basell, including those in California, Kentucky, Texas, and Washington. 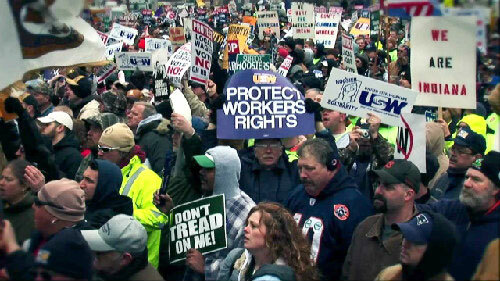 The USW represents 30,000 workers that run more than 200 refineries, terminals, and pipelines. The number of workers on strike and on the picket line is over 5,000… so far. Which side are you on? 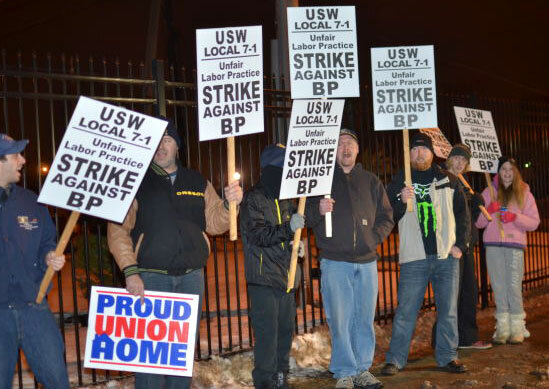 Workers on the picket line at the BP refinery in Indiana. Photo/The Times of Northwest Indiana. The workers are striking because of unsafe and dangerous working conditions. Their grievances include a stop to “daily occurrences of fires, leaks, emissions, and explosions, brutal and dangerous scheduling practices,” as well as layoffs, speed-ups, and the hiring of inexperienced non-union labor. The strike kicked-off when talks collapsed with Shell Oil, which is leading the industry-wide negotiations. BP and the other oil companies are now hiring scab labor to keep their operations going. The work stoppage is the largest nationwide strike in the U.S. since 1980. Addressing the public and fellow workers both unionized and non-unionized, the strikers made it clear that “138 workers were killed on the job while extracting, producing, or supporting oil and gas in 2012,” a number “more than double” the fatalities suffered in 2009. The workers charge BP and the other oil giants with cutting back on safety protocols and intensifying layoffs and speed-ups to keep profits high. Here it should be remembered that 11 workers were killed when BP’s Deepwater Horizon oil rig exploded and sank into the Gulf of Mexico on April 20, 2010. But what does any of this have to do with the Los Angeles Country Museum of Art (LACMA)? I always viewed LACMA’s relationship with BP as an ethical dilemma for the arts community, from BP shaping an arts institution to LACMA being a partner in the oil giant’s “greenwashing” propaganda. However, the nationwide workers’ strike against BP adds a new wrinkle to the entanglement - revealing once more the difficult interface between art and capitalism. 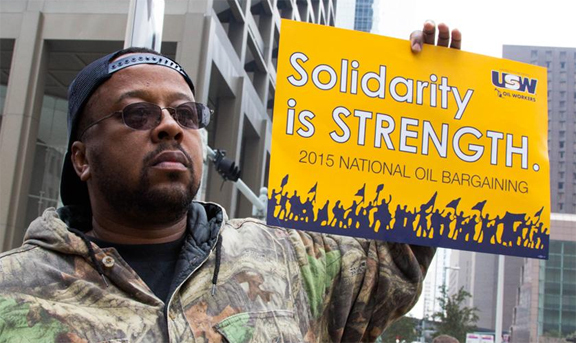 Workers picket BP refinery in Indiana, Feb. 2, 2015. Photo/USW. If thousands of workers are on strike against BP because of deplorable working conditions that are literally taking workers’ lives, and BP is a major contributor to LACMA… what then does that make the museum? Is it really an impartial institution? Does it actually need to be said which side LACMA is on - with the workers, their families and friends - or with BP? Can Michael Govan and LACMA really tell the public that the museum has nothing to do with politics or the strike, when LACMA takes BP’s money and museum visitors have to walk through the “BP Grand Entrance” to enter the museum? And what happens if the workers’ national strike against BP and the other giant oil companies grows larger, drawing in the 30,000 workers of the United Steelworkers Union and affecting the 200 U.S. sites they work at? The union represents the workers that run nearly two-thirds of the oil refining plants in the U.S. The largest nationwide strike in the U.S. since 1980. Photo/USW. In the glorious labor history of the United States, a movement that gave us the eight-hour day, higher wages, better working conditions, paid vacations, and other benefits… when workers called a strike, other workers and the general population supported it. That is how the working class in America advanced, not through the largess and goodwill of a super-rich minority, but by workers making demands on them and uniting in the cause to create a better life for the majority. The Los Angeles County Museum of Art makes use of union labor, as well as non-union labor, together with what is euphemistically referred to as “volunteer” labor. Some 350 people are employed at LACMA, but there are also security, janitorial, maintenance technicians, and other contracted laborers that work at LACMA. In June of 2012, LACMA workers were fired as the museum looked for ways to “best deploy resources,” all the while spending $10 million dollars on the “Levitated Mass” project and paying director Govan an annual salary of $915,000 - twice the amount of a sitting U.S. president! What if workers at LACMA decided to walk off their jobs in solidarity with the striking workers who wage a life and death struggle with BP? It has all happened before, you know. 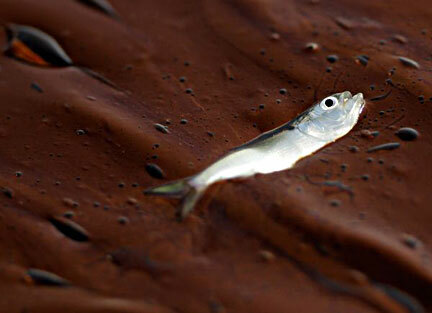 Dead fish floating in oil during the BP Gulf of Mexico oil disaster of 2010. Photo by Charlie Riedel for the AP. A monumentally important federal court ruling was quietly made on Sept. 4, 2014; it was a decision barely reported on by the national media. On that date a federal judge in Louisiana found BP responsible for the Gulf of Mexico oil disaster of 2010, the worst oil spill in the history of the U.S. The court also found the oil giant guilty of being “grossly negligent” in failing to conduct proper safety tests in the run-up to conducting deep sea oil drilling from its Deepwater Horizon oil platform in the Gulf, negligence that lead to the platform blowing up and killing 11 workers. The explosion resulted in some 4.9 million barrels of crude oil being dumped into the Gulf. The ruling in the high-stakes trial presided over by Judge Barbier now opens the likelihood that BP will be forced to pay some $18 billion in fines for its violation of the Clean Water Act, enacted in 1972 as the principal federal law in the U.S. when it comes to water pollution. BP was quick to condemn the ruling, and announced plans to appeal the decision. 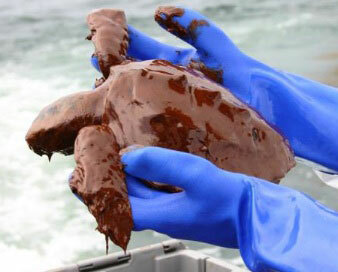 A sea turtle covered with oil during the BP Gulf of Mexico catastrophe of 2010. Photo courtesy of the Florida Fish and Wildlife Conservation Commission. BP might want to refer to Michael Govan, the Director and CEO of the Los Angeles County Museum of Art, as a character witness. Mr. Govan of course accepted $25 million from the oil giant in 2007, telling the L.A. Times at the time that he took funding from BP because: “What was convincing to me was their commitment to sustainable energy.” In its May 1, 2013 newsletter, LACMA informed the public that it was “pleased to announce” the renewal of BP’s corporate sponsorship. LACMA continues to tout BP as a corporate sponsor. I first wrote about the relationship between LACMA and BP on March 14, 2007, and since then the oh-so-liberal L.A. arts community has remained stone silent when it comes to the issue of the world’s largest polluter funding the city’s leading art museum. Not so surprisingly, Michael Govan has refrained from issuing a single word of disapproval towards the oil-soaked, criminal benefactor of the museum he directs. Everything I have written on the subject of LACMA and its monstrous sponsor has been vindicated by the ruling of Judge Barbier, and I will not cease writing such articles until the relationship between LACMA and BP is finally terminated. 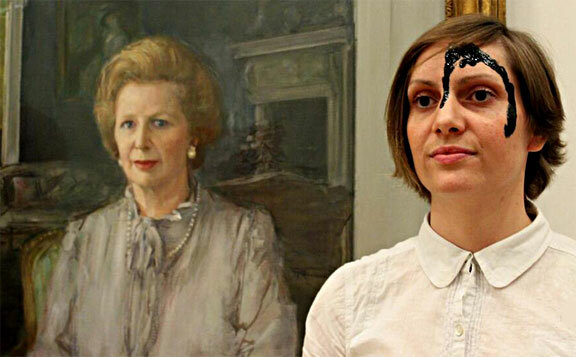 During a protest at London's 2014 BP Portrait Award at the National Portrait Gallery, an anonymous artist, her face splattered with oil, stands before a portrait of Margaret Thatcher. Photo by Jen Wilton/Art Not Oil. I am one of 205 signatories to a letter published in The Guardian that asks the National Portrait Gallery of London, England to end BP funding of its esteemed annual competition and prize, the so-called BP Portrait Award. Published on June 24, 2014 the letter was timed to coincide with the museum “celebrating” 25 years of BP sponsorship. Also commiserating the 25th anniversary of BP sponsoring the National Portrait Gallery is the U.K. arts activist organization, Platform (a member of the Art Not Oil coalition). Platform released a report titled: Picture This - A Portrait of 25 years of BP Sponsorship. The report details “25 of BP’s major environmental catastrophes,” one for each year that BP sponsored the National Portrait Gallery Portrait Award since 1989. Screen shot of an anonymous activist from the Art Not Oil anti-BP performance at the National Portrait Gallery, June 21, 2014. Image courtesy of Clear Blue Films/Art Not Oil. 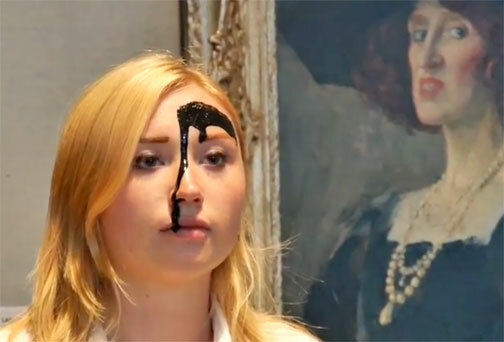 In the run-up to the 25th anniversary of the BP Portrait Award of 2014, dozens of art activists from the Art Not Oil coalition staged a June 21, 2014 silent performance inside the National Portrait Gallery that they called, 25 Portraits In Oil. 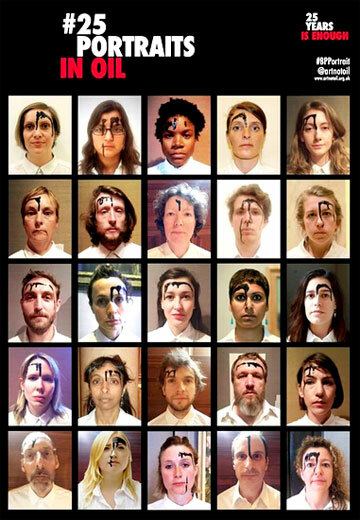 Gathering in the gallery and wearing white, 25 performers simultaneously poured what appeared to be oil on their faces. These individuals then scattered throughout the museum, taking up positions to mutely stand before various portrait paintings in the collection. A short video documenting the 25 Portraits In Oil intervention at the National Portrait Gallery can be viewed here. Another good example of arts activism would be the brilliant Reclaim Shakespeare Company, formed in response to BP’s sponsorship of the Royal Shakespeare Company in 2012. The “Guerilla Shakespeare” troupe’s website cleverly alters the Bard’s famous Hamlet line into the slogan “BP or not BP.” They perform public art interventions in Shakespearian style at venues and events funded by the oil giant. Most recently they have criticized the BP sponsored exhibit Vikings, life and legend, held at the British Museum. The Reclaim Shakespeare Company not only invaded the museum to hold an anti-BP performance replete with Vikings brandishing BP logo emblazoned shields, they lampooned the official British Museum promotional video for the Vikings exhibit with their own parody video, BP Vikings - Pillaging the planet. The artists and activists of the U.K. are to be commended for their creative and non-violent opposition to oil-industry sponsorship of the arts. But there is much work to do, especially here in “liberal” L.A., where not a single protest against BP sponsorship of the Los Angeles County Museum of Art has occurred since that oleaginous relationship was established in 2007. In my writings on the subject I have attempted to link BP’s sponsorship of LACMA, not just with environmental destruction, but with the wider topics of military adventures and imperialism (Iraq, Libya, etc); examinations of the debilitating supremacy corporate power exercises over the arts and democratic institutions, and the interlocking systemic nature of the crisis. These are just some of the questions that must be confronted if we are to succeed in righting the art world. Govan’s statement should not be read as a point of pride, but of shame. Three years later BP’s 2010 Gulf of Mexico disaster occurred, leaking over 200 million gallons of crude oil into the Gulf; it would be the largest environmental catastrophe in U.S. history. On June 9, 2014, the U.S. Supreme Court refused BP’s request that its damage compensation payments of some $5.5 billion to businesses ruined by the Gulf disaster be stopped while the oil company appealed the original U.S. 5th Circuit Court of Appeals decision calling for the payments. Trial proceedings slated for Jan. 15, 2015 will determine the fines BP must pay for their role in the Gulf catastrophe, fines that are likely to surpass over $20 billion dollars. To this day LACMA proudly exalts BP as a major corporate sponsor. It is ironic that BP’s $25 million dollar donation to LACMA in 2007 was the exact amount the U.S. Environmental Protection Agency made the oil company pay in civil fines for spilling over five thousand barrels of crude oil in and around Prudhoe Bay on Alaska’s North Slope in 2006. The Prudhoe Bay Oil Field is operated by BP, it is the largest oil field in North America, but Prudhoe also looms large for another reason. If you remember, the failed Jeff Koons Train “sculpture” for LACMA had a projected cost of $25 million. 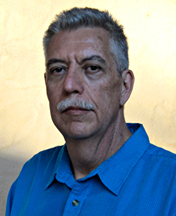 That boondoggle project entailed hanging a 70-foot steam engine locomotive from a 161-foot crane at LACMA’s BP Grand Entrance; Michael Govan equated the proposed monstrosity to the Eiffel Tower in Paris. Train was only derailed by the U.S. financial crisis of 2008-2012. When LACMA’s endowments and donations plummeted from $129.7 million to $29 million in 2008-2009, the Choo-Choo Train project was pushed back to 2015. Since the U.S. has not yet recovered from the financial crisis, things are looking bleak for Train. However, there does seem to be a splendid, lower cost, alternative installation for LACMA, but I would be remiss not to first mention BP’s role in Iraq. The financial news and opinion website, 24/7 Wall St., reported that oil production in Iraq “is now second only to Saudi Arabia” with oil production “of around 3.3 million barrels a day.” 24/7 Wall St. also reported that BP “has a 38% working interest in the Rumaila field in southern Iraq,” one of the “five largest oil fields in the world” with proven reserves of “nearly 18 billion barrels.” As of this writing, thousands of militants from the Al Qaeda-offshoot, the Islamic State of Iraq and Syria (ISIS), have succeeded in routing the U.S. trained and financed Iraqi armed forces in the north and west of the country. As worn-torn Iraq literally implodes, looking much like Vietnam during the 1975 fall of Saigon, BP is working like the dickens to get every last drop of Iraqi oil before it is too late! Image: Unidentified artist, "I always feel like somebody's watching me (BP Puma Drone)," 2014, Puma surveillance drones, wire, and paint, 20 feet x 15 feet, British Petroleum Art Foundation, London; Gift of Bob Dudley (BP CEO, & Carl-Henric Svanberg (BP Chairman. © 2014 BP /Artists Have No Rights Society (AHNRS), International. Photo courtesy of Tony "I'd like my life back" Hayward. Perhaps it is no surprise that the spin doctors employed by BP to continually present a forward-looking face for their client, have come up with a new direction for LACMA and BP to show their unity. 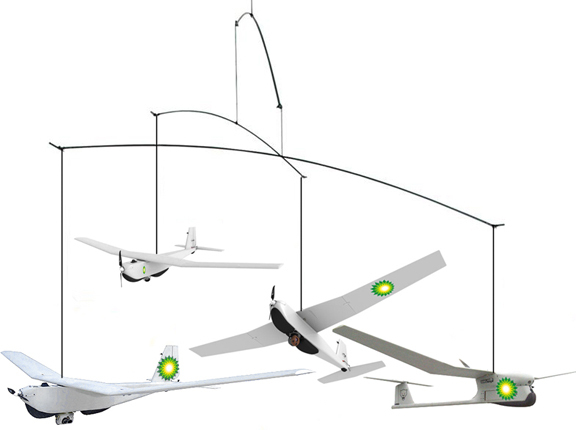 Anonymous sources have informed me that LACMA is considering purchasing I always feel like somebody’s watching me (BP Puma Drone), a new kinetic sculpture created by an as yet unidentified conceptual artist. Rumored to cost substantially less than the $25 million Koons Train (though the actual purchase price has not yet been verified), I always feel like somebody’s watching me (BP Puma Drone) openly celebrates the sponsorship of BP. Slated to hang at LACMA’s BP Grand Entrance to welcome visitors, the outsized metal mobile is powered, not by wind, but by the electricity generated from the solar panels sitting atop the BP Grand Entrance. Constructed using four actual U.S. military Puma drones with 9-foot wingspans, the mobile’s drones are equipped with surveillance cameras and working propellers! I always feel like somebody’s watching me (BP Puma Drone) will not only be in perpetual motion, providing a convivial attraction to museum goers, it will also provide unending surveillance of all patrons passing through the BP Grand Entrance. Given that LACMA is always on the cutting edge, arrangements have been made with the artist to assure the drones are outfitted with a newly emerging technology, 3-dimensional face recognition. Museum visitors who are LACMA members will be instantaneously scanned and identified by I always feel like somebody’s watching me (BP Puma Drone), allowing for immediate free access to all museum events! The recipients of the gathered intel cannot be divulged, but privileges do have their costs. I always feel like somebody’s watching me (BP Puma Drone) will be a rare acquisition for LACMA, as it is a contemporary work of art that presents a clear, unambiguous message with social content. Inspired in part by the works of the American sculptor, Alexander Calder, the installation of I always feel like somebody’s watching me (BP Puma Drone) will coincide with LACMA’s exhibit, Calder and Abstraction: From Avant-Garde to Iconic.